September 9, 1989 in Cedarwood saw a remarkable event in the natal department of the General Hospital. Two sets of twins were born to the McCallister family and the Pascucci family respectively. Ian and Evan McCallister and Rainne and Rio Pascucci were destined to be a part of each other's lives due to the circumstances of their births, and so it seemed to be for the first nineteen years of their adolescence. Paradise by the Dashboard Light by Kathryn R. Biel is the story of what happens to them when a terrible secret rips their lives apart. Ten years after the events that destroyed their friendship, Ian and Rio meet up in Boston and discover they have a connection that is hard to ignore. Despite their sizzling chemistry, there is still a deep dark secret that threatens to keep them from fulfilling their destiny to be together despite the obstacles in their paths. Can their past be overcome, or will they face the future without each other? This is a great read, a love story that will have you hooked until the very last page. Kathryn R. Biel has created characters that are complex, passionate and stubborn, and they will make you want to bang their heads together! They face the sort of obstacles that we have all encountered in our relationships, and she has also explored family issues that impact on the main characters. Paradise by the Dashboard Light is an emotionally charged story of love and passion, with a healthy dollop of lust thrown in for good measure! It is also a chance to examine the relationships between twin siblings and the connection they share. Rio and Ian have a rocky road to travel if they want to be together and the journey is a thrilling one. I recommend you take it with them! Paradise by the Dashboard Light uncovers the complicated relationship between a set of twins which started at their birth. Evan and Ian were preemies with medical issues. Rainne and Rio were born to a woman who could barely care for herself. Kathryn Biel intertwines their lives - while Ian is infatuated with Rainne, Rio loves Ian. And Rainne is just mean enough to string him along so he never notices Rio. The time comes when the twins switch places and they make mistakes which take a decade to unravel. Ian doubts he can trust either of the Pascucci twins. As he finishes his doctoral training, he is torn between reaching his goals and grasping for a love he can’t live without. Kathryn Biel brings a romance that will entertain you with a turmoil of emotions. Paradise by the Dashboard Light is a mixture of drama as these old friends find that the chemistry between them will either draw them closer or repel them. I love how the author brings these two together in unlikely circumstances. I would like to mention that the humor in this novel will endear you to this couple as they try to find common ground. The reality that most relationships have misunderstandings is a given as the author magnifies their emotions in this contemporary romance. I would recommend this book for all those who love a hot romance; not just this novel but all of Kathryn Biel’s books look promising for a good read. You will love how the story switches between Rio and Ian, allowing the reader to hear both sides of the story. Paradise by the Dashboard Light is a work of contemporary romantic fiction by author Kathryn R. Biel. Written for adults, the novel takes us through the complexities of the life of its hero, Rio Pascucci, a strong independent woman who thinks she’s left a difficult life in Ohio behind. When a blast from her past arrives in the form of old crush Ian McCallister, things take a complex turn. Rio and Ian were never together when they were younger, and Ian always had a thing for Rio’s twin sister, but now Rio’s love for Ian is renewed. Secrets and heartache from the past are sure to rise up again, and it becomes a question of whether the past can be left to lie for new love to bloom in the present. Rio is a perfectly balanced heroine in the tale, suitably vulnerable considering the emotional turmoil she’s going through, but also strong and pro-active about trying to get on with her life and leave the past behind. I think the audience’s knowledge of Rio’s secrets is really fun as it keeps you on your toes, wondering when certain things might be revealed. Kathryn R. Biel writes realistically when describing Ian and his feelings, rather than making him a cardboard-cutout perfect male lead. 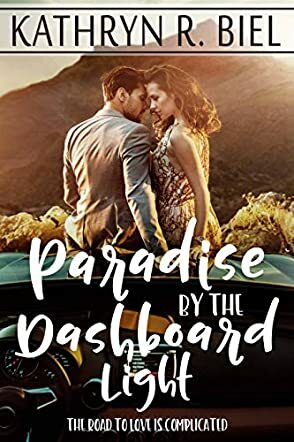 With an intriguing plot line, genuine heartache and realistic characters, I can see many romance fans enjoying Paradise by the Dashboard Light, and coming out the other end desperate for more from this very talented author.